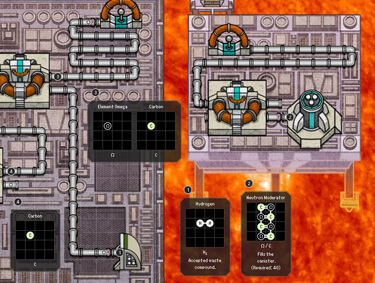 SpaceChem is an obscenely addictive, design-based puzzle game about building machines and fighting monsters in the name of science! Take on the role of a Reactor Engineer working for SpaceChem, the leading chemical synthesizer for frontier colonies. Construct elaborate factories to transform raw materials into valuable chemical products! Streamline your designs to meet production quotas and survive encounters with the sinister threats that plague SpaceChem. SpaceChem is free for schools. Learn more by reading our guide for educators, and contact Zach at zach@zachtronics.com when you're ready to give it a try. By looking at our score collection metrics for SpaceChem, we’re able to tell how far people get through the game on an aggregate level. Unsurprisingly, not many people finish the game. One of the biggest problems with this is that many people start reading the story but then are unable to finish it. Now that SpaceChem has been out for a year, we’ve decided to release a stand-alone version of the story. 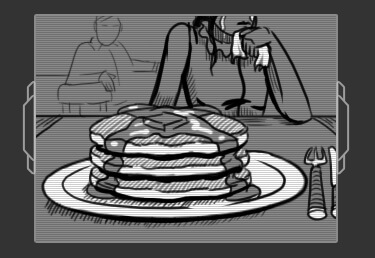 Curious what happens to Bruce and our nameless protagonist? Find out now! Explore the past with SpaceChem’s first DLC pack, “SpaceChem: 63 Corvi”. Follow a young Bruce Novak, the future CEO of SpaceChem, and his team of engineers on a mission to collapse the star 63 Corvi into a collapsar gateway and expand the human empire. 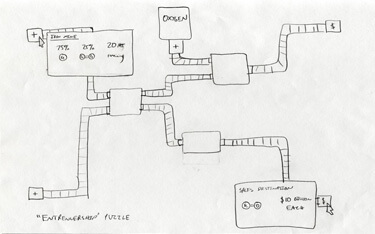 Gameplay features a new mechanic, the “quantum junction”, which takes ResearchNet’s quantum tunnel to the next level. The SpaceChem that you all know and love is actually quite a bit different from the SpaceChem that I originally envisioned. Curious what changed? Check out these high-fidelity concept sketches and try to figure out what you're looking at!